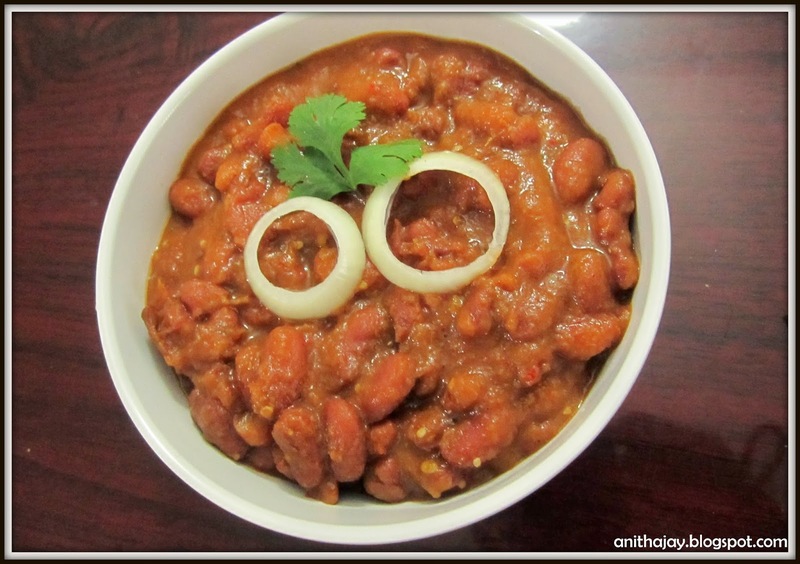 Rajma masala is an authentic Punjabi recipe.Best combo for Roti or chappathi. Kidney bean has many health benefits , it has good source of cholesterol-lowering fiber, as are most other beans. In addition to lowering cholesterol, kidney beans' high fiber content prevents blood sugar levels from rising too rapidly after a meal, making these beans an especially good choice for individuals with diabetes. Wash and soak Rajma for over night. Pressure cook Rajma with salt it for 5-6 hisses. Heat oil in pan, add cumin seeds,Once splutter add ginger garlic paste. Cook until it raw smell goes. Add chopped onions , cook till it become translucent. Add tomatoes, all masalas,salt and cook till the tomatoes become juicy and separates from the sides. Let it cook until rajma coated well the gravy. Serve hot with Chappathi or rice.